An executor is the person named in a will to handle the will maker’s estate upon his death. The executor is responsible for managing the estate assets throughout the probate process and then distributing those assets to the estate’s beneficiaries in accordance with the decedent’s will. When an executor learns that a will maker died, he must locate the will and contact an attorney to begin probate. The attorney who helped the decedent make the will is often willing to assist the executor with probate. The executor must submit the will and an original death certificate to the probate court in the decedent’s county of residence. 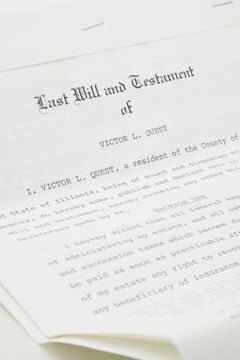 The court will confirm the will’s validity and formally authorize the executor to administer the estate. The executor is responsible for taking control of all the decedent’s assets. She must take an inventory of all real estate and personal property and have anything with an undetermined value appraised. The executor also has a duty to contact any life insurance companies with which the decedent had a policy and submit a death certificate. She must follow up with the company to make sure that the policies’ proceeds are distributed to the decedent’s beneficiaries. Finally, the executor must open an estate bank account, close any of the decedent’s bank accounts and transfer funds from those accounts into the estate account. A person named in the will to receive a portion of the decedent’s estate is called the beneficiary. An executor has a duty to notify all beneficiaries that the will maker is deceased and that they may receive an inheritance from the decedent’s estate. The notification of pending inheritance must be in writing and should also contain a copy of the will. The executor cannot give any property to a beneficiary until the decedent’s outstanding debts are paid. Those debts can include credit card bills, mortgage, rent or lease payments, car payments, utility bills and taxes. Other expenses that may arise after the decedent’s death are funeral costs, attorneys’ fees and estate taxes. The executor is also entitled to compensation, generally a percentage of the value of the estate, which varies by state. The executor’s final duty is to distribute the remaining assets to the decedent’s beneficiaries. Beneficiaries may receive particular property, such as jewelry or the decedent’s home, but they may also receive proceeds from the sale of an asset or a percentage of the funds in the estate bank account. When each beneficiary receives what he is entitled to under the will, the executor must close any bank accounts opened during probate, prepare an accounting for submission to the probate court and close the estate. Estate Settler: What Are the Responsibilities of the Executor? A., Bernadette. "The Duties of an Executor After a Person Dies." , https://legalbeagle.com/12072272-duties-executor-after-person-dies.html. Accessed 22 April 2019.